Look at the front of the menu; this is why the restaurant is named Mamakas, a play on the word mamakia, which is slang for Mama’s boy. Thanos Tripi is very proud to be not only a Mama’s boy but also a Grandma’s boy and an Auntie’s boy. As a young lad Thanos, being also the youngest, was often brought into the kitchen by these three lovely ladies and, thus, his food passion was birthed. Thanos is the owner and big personality behind the very successful restaurant Mamakas. Thanos is also delightfully humble. When I asked him about the success of the restaurant he said it was part due to the magnificent food his executive chef, Chris Kalisperas, produces, the design of the space, and the servers. He then goes on to credit being on the hottest street in the city, Ossington Avenue, and being the new kid on the block. Thanos took possession of 80 Ossington Avenue, as it had sat empty for quite some time; being originally from the world of nightclubs and conceptual design he wanted to get the right fit. At first it was going to be more of a fast food place, a spanakopita take out but none of these felt right. Finally, he landed on fine dining in a comfortable space where he could pay homage to the classics; elevating them to the present. He and Chris would have been wonderful in my series about Great Ethnic Home Cooks have they not been in the industry, as this is what I am always going on about. If you do not know how to cook the classics then you will not be successful changing them. In the restaurant is an incredible light box designed by Thanos and executed by a Greek artist. It is, as many things Greek, a political satire. This type of art, Karagiozis, heralds from ancient Greece using puppet dolls to send messages out to the people. These shadow puppets can be seen along the length of the back room and are quite incredible. Good music should be gently heard but not over powering, which, unfortunately, does not happen in far too many restaurants. I am delighted to report the music, also Greek, is fun, playful and just the right side of heard but not heard if you get my drift. Both owner and chef share the food philosophy that using the highest quality of product, simply handled, makes the best food. I will openly admit to being fortunate enough to call Chris Kalisperas a friend, and this friendship came about with a strong mutual respect for proper training, a passion for local product and a very strong work ethic. All of this can be seen at Mamakas. Taramosalata, Tzatziki, freshly baked Pita and the lovely women in Thanos' life. A good friend Suzie Durigon (@justcrumbs) joined me this evening. Her passion for food and her palate made her the perfect choice, not to mention she is a good eater, like me, as we had a lot of incredible food to eat. Meet Cody, he was our server and like all the servers at Mamakas he was very well educated on both the wines and food. I was chilly so I wanted a glass of red wine. The wine list is completely Greek so I was looking for help. I wanted a full bodied but low tannin wine as we were eating seafood as well. Cody was quick to offer tastes of a few before we landed on our entire favourite, Gaia S.
Dinner started with some familiar sounding and looking but not familiar tasting Taramosalata, the most refined and sublime cod roe and potato dip and a thick, rich, Tzatziki. These like all the dishes were liberally doused in a lovely grassy Acropolis Organic olive oil from Greece. 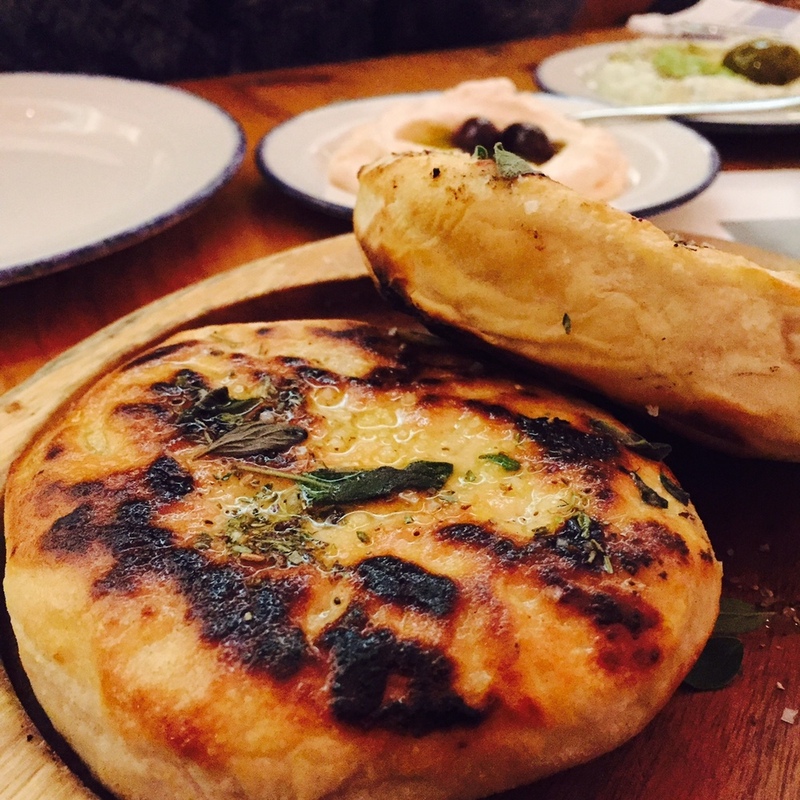 Hot homemade thick herbed pitas on a wooden board were the kind you want to put in your pocket and take home for breakfast. Hey, I may be on to something guys. Next up was Achinos, sea urchin, the foie gras of the sea. It was perfectly presented with a hint of fennel, chili and lemon again with that scrumptious olive oil. Place this on top of those warm pitas and have a little party. 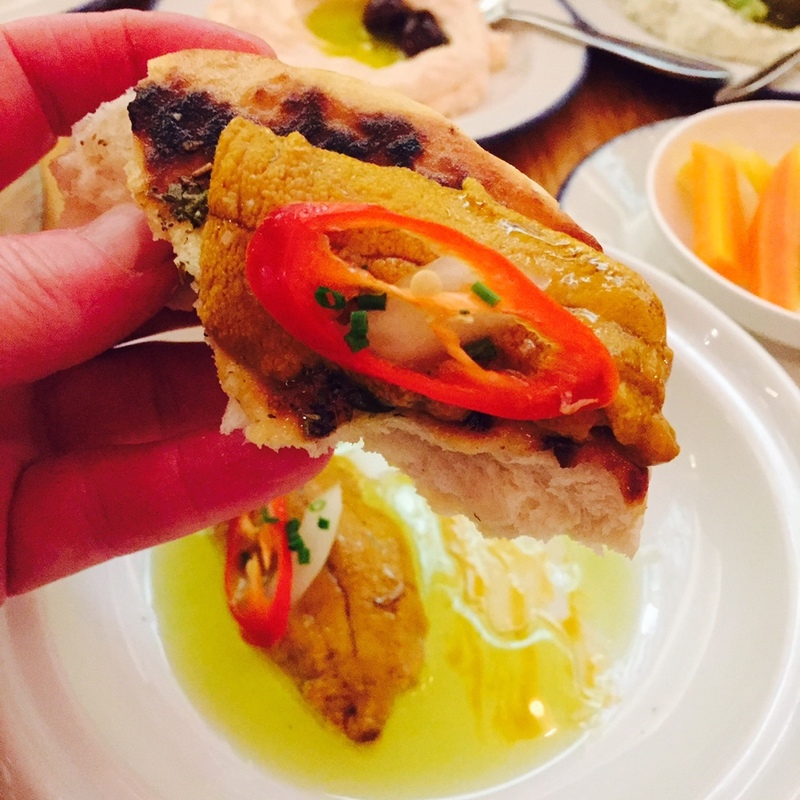 Sea urchin is perfect on top of the homemade hot pita. I am a halloumi addict and Chris really knows how to make the most out of this very cool cheese that never melts. First he goes local using Monforte Halloumi, which he grills and serves with compressed clemintines, carrot puree and pistachios. Look for this dish to change with the seasons. Goat tartare was beautifully hand chopped and served on a bed of sheep’s milk, yogurt and feta all mixed together. Tiny hints of pickled beets were the same rich colour as the meat. The dish was served with shaved beets, that I found a little bland. I think beet chips might have been a fun way to go. Imam Bayildi, roasted and stuffed vegan eggplant. A Turkish dish I have had many times surfaced as a completely vegan mezze, Imam Bayildi, stuffed roasted eggplant rich with tomatoes, onions, chili, chopped walnuts, parsley pesto and purslane salad. This was so very satisfying that if I were vegan, I would have this as an entrée. Octopus, as we have often chatted about, is a dish that is often made poorly, but, again Chris nailed it. Steamed, placed in sous vide and then grilled Oktapodi with a puree of Santorini favas, shot with lots of lemon, caper leaves and pickled onion. I adored the octopus but I found there was a lot of acid in this dish from lemon to pickled things I lost the favas and favas are a great bean. Last up on the mains was lamb, being one of my all time favourite meats. Chris gets his lamb from a butcher you too can visit called Mr. Greek Meat Market, located at 801 Danforth Avenue. Please do not order these chops medium or well, let Chef Chris handle how they should be cooked. They were charred with a rosy pink center sitting and warming a bed of bulgar, chopped vegetables and tzatiki. Desserts are few but thoughtfully executed and presented as a fun play on sweets. We were stuffed but for all of you we sacrificed and kept on eating, te-he. Karithopita, is carrot cake Greek style and then deconstructed. A rich, dense walnut cake, with crisp ribbons of candied carrot, coffee cream, crumble and cinnamon ice cream it was, funny enough, not overly sweet. Maybe it’s the nuts? All in all a must go to. Try a weeknight. They are not jammed packed and the servers have more time to teach you many things about the food and where it hails from. For the record I like table 10, a cozy one at the back that is perfect for romance and fun people watching. Starting February 1st Mamakas will be open on Monday nights from 530pm to close. Please check it out and let the guys know I sent you. Maybe there will be a little added treat? As with all my reviews, let me know your thoughts. They are most welcome. Fore more info, visit Mamakas online.